Top: Our city service request marked "closed." Middle: Our photo of gang symbols at Marovitz Golf Course on July 14. 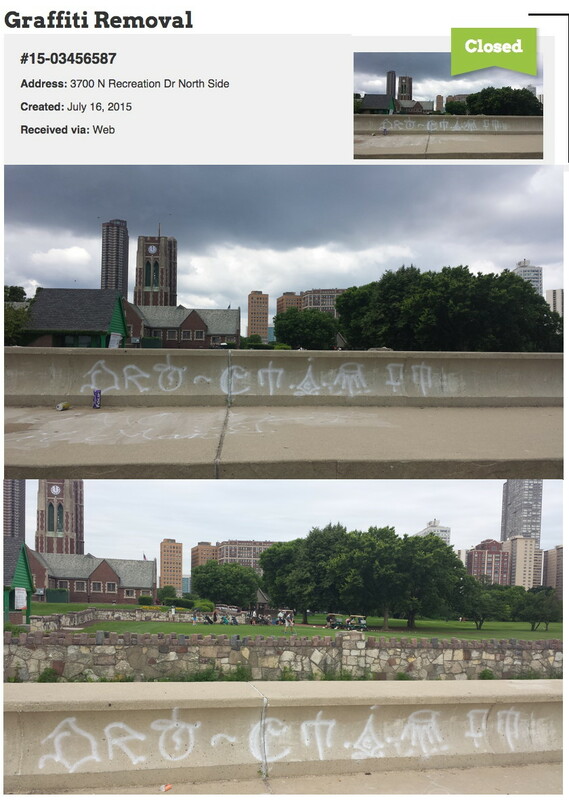 Bottom: The same location on July 20, after the tags were "removed." 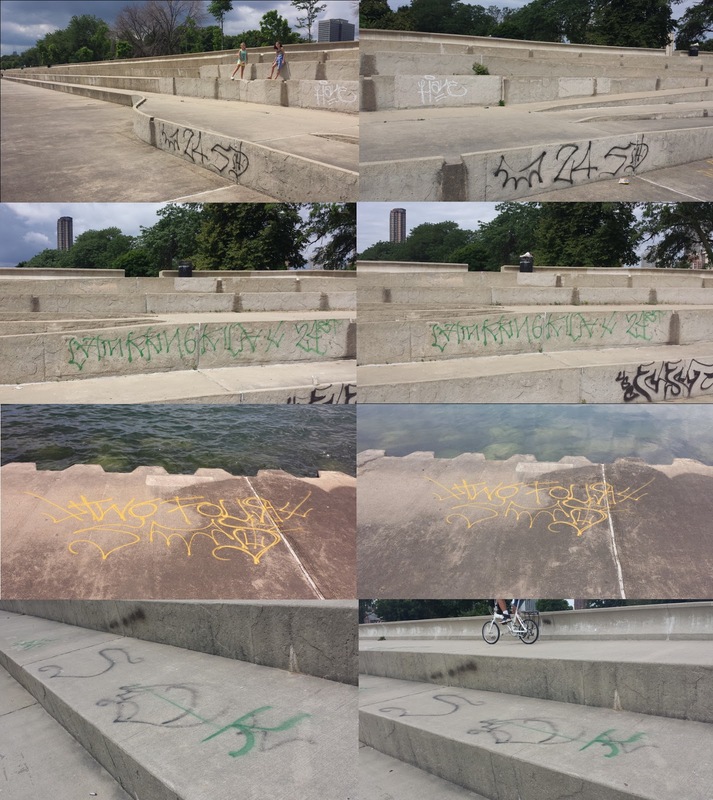 For the second summer in a row, CWB Chicago editors last week documented significant gang tag activity along the lakefront north of Belmont Harbor. And, for the second summer in a row, we submitted reports of the graffiti so the city could remove it. And, for the second summer in a row, the city closed out our requests as "completed" without removing a single speck of the gangs' tags. The tennis courts, baseball fields, Sydney Marovitz Golf Course, and lakefront seawall are great places to grab some sun and take in a game. But, as we have reported frequently, the area becomes a magnet for gang bangers at sunset. So, you'd think that the city would want to—oh, I dunno—remove the gangs' spray-painted threats to kill each other. Especially when a group of citizens takes the time to fill out the tedious online forms and submit pictures of every tag. But, no. Not in Chicago. Instead, Streets & Sanitation crews did absolutely nothing and then marked all of our graffiti removal requests as "complete" less than 24 hours after we filed them. On the City Data Portal, our jobs are closed out as "completed" or "completed-duplicate" even though all of our photos were of different tags and we intentionally used different addresses for each case. All together, we documented nearly 25 sets of gang tags along the Rec Drive seawall. Here are some pictures from before the city "removed" these gang tags and after the jobs were "complete." Let's take a look! Here are four before and after sets. Photos on the left are from July 14. 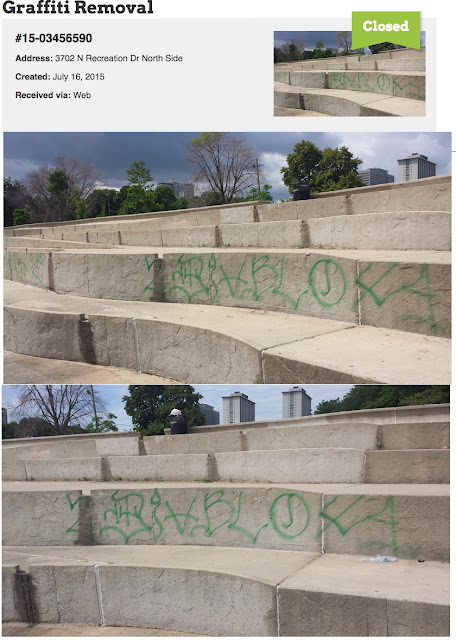 Photos on the right were taken July 20—after the city "removed" the tags.